CD review: "Two Against Nature"
This review first appeared on SignOn San Diego on May 5, 2000. 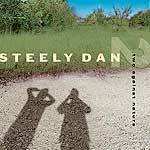 But Steely Dan pulls it off with their new release, "Two Against Nature." Nine new compositions from Donald Fagen and Walter Becker show that though two decades may have passed since "Gaucho," they've lost neither their jazzy edginess nor their ability to turn out well-crafted pop tunes. It was always their songs that set Steely Dan apart, their ability to write music that balanced immediate accessibility against something deeper that holds up well to repeated listening. Let's face it, after the 10th time of listening to "Carry On My Wayward Son," you simply know you never need to hear it again, while "Deacon Blues" or "Rikki Don't Lose That Number" are like an old Sinatra or Ellington song  there's something a bit more there, little hidden nooks and crannies that you might not even hear until the 25th or 30th listening. "Two Against Nature" continues that, and is one of those rare albums that actually exceeds the hype. Fagen and Becker pick up right where they left off when the writers of "That '70s Show" were still in high school. They still meld funky back beats with jazz-tinged instrumental passages, topped with Fagen's distinctively reassuring vocals. No, the lyrics make no more sense than back then  but it's their obscurity that lends them their charm. And if there's nothing quite as good as "Deacon Blues" on here, well, most folks never get to write anything as lasting as that song. Besides, "What a Shame About Me" and the title track are as good as any other song they ever wrote (take your pick from "Hey Nineteen," "Peg," "Reelin' In The Years"), and that's some pretty good company.